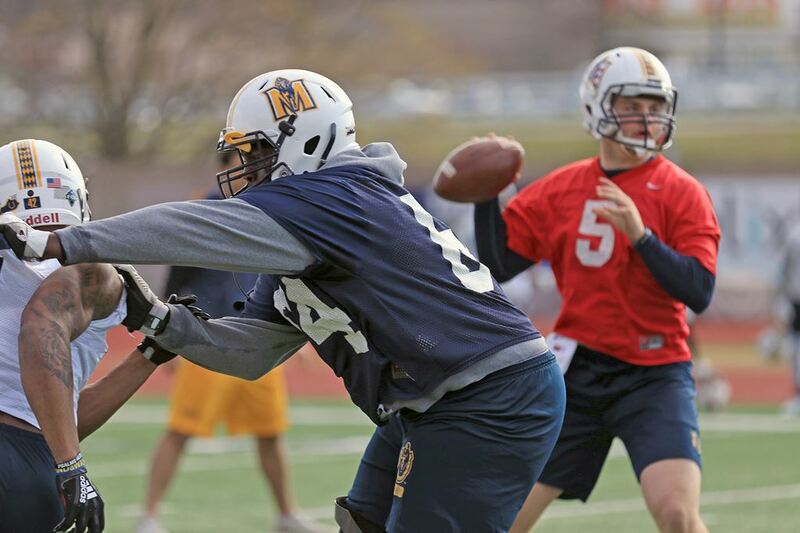 This spring the Racer football team returns to Roy Stewart Stadium in preparation for the 2019 season. Over the course of the entire spring camp, Go Racers.com will shine the spot light on each of the position groups and talk with their specific coach to get their thoughts on the spring in general, who is returning and what they will be working on over the next five weeks. Essentially, everyone. Thirteen offensive linemen return from the 2018 campaign, including four starters. Of the four starters returning, three of them, HERO Sports Freshman All-America Levi Nesler, Jacob Vance and Christopher Georgia started 10 off 11 games for Murray State last year, while the fourth, Cam Carter, started all 11. In addition to those four, Shane Walker and Oistin Jones also return in 2019 after getting two and one starts, respectively, a season ago. Only two linemen were lost from the 2018 team, both to graduation. After being a stalwart on the line for four years and starting 43 of a possible 44 games in his career, Chris White finally said goodbye last November. As did J.R. Burns, who notched 11 starts himself over the course of his two years in Murray. BH: I am really excited, because there are not that many opportunities in coaching college football where you get to bring back your entire room. We only graduated two guys last year, so that left us with 13 for the spring since we didn't bring anyone in at midyear. So that gives us a lot of guys that understand exactly how we do things, exactly how we see things and exactly how we communicate. For us, we are probably a little bit further ahead than most teams in the spring just because of the continuity. GR: Unlike the fall, there is no opponent in the spring, so you can just focus on yourselves. What are some areas you guys are honing in on this spring? BH: We have to work in the run-game on playing on their side of the line of scrimmage, being violent off the snap and then finishing. Finishing being engaged, finishing locked out in pass-pro, finishing with body-on-body in the screen game. Like I said before, when you have the gift of everybody coming back, your expectation can't just be getting it right. You have to put an emphasis on how you finish a play, where you are, your finishing position. So for us it's everything we talk about every day, were going to be violent at the snap and then were going to finish through the whistle. GR: What are some observations you have had of your unit so far? BH: Number one, I don't have to coach effort, which is a gift. Everybody plays as hard as they can and everybody is giving me every drop of talent that they have. I am really, really pleased with Jacob Vance taking some reps out at tackle, it's been a really nice change for him. Cam Carter is really just working on perfecting his craft, while Levi Nesler is the same way. Those two have to push to improve, but with the depth that we have by bringing back 13 guys that know there is just competition at every spot. Dallas Danner has had a really productive spring thus far, Jacob Frye has had a really productive spring. Chris Georgia has done well, but sometimes you don't notice, just because he does everything right. So we are just trying to make sure everyone know "I've got to have a good day, I've got to be out here competing, I've got to be supporting whatever my role is. If it's the one, it's the one, if it's the backup, I've got to be ready to go.